A variety of wildlife roam the park, in­cluding white-tailed deer, raccoons, armadillos, foxes, bobcats, javelina and a variety of squirrels. Occa­sionally we see a black bear, mountain lion or badger. Vege­tation is sparse, the terrain is rocky, and deep canyons bisect the park. The erosive forces of rain and flood continue to deepen and widen Seminole Canyon year after year. These forces have exposed rock deposited up to 100 million years ago, during the Age of Dinosaurs. Back then, ancient inland seas repeatedly flooded the landscape and then withdrew. Alternating layers of clay from the land and lime from the ocean tell that story. Look for this layer cake effect in the canyon walls. During the Pleistocene ice age (12,000 – 10,000 years ago), the region’s moderate climate supported lush vegetation. This included pine, juniper and oak woodlands in the canyons and thick grasslands on the uplands. Ice Age hunters pursued now-extinct species of elephant, camel, bison and horse across the plains. By 7,000 years ago, the landscape resembled the dry terrain we see today. A new culture emerged. 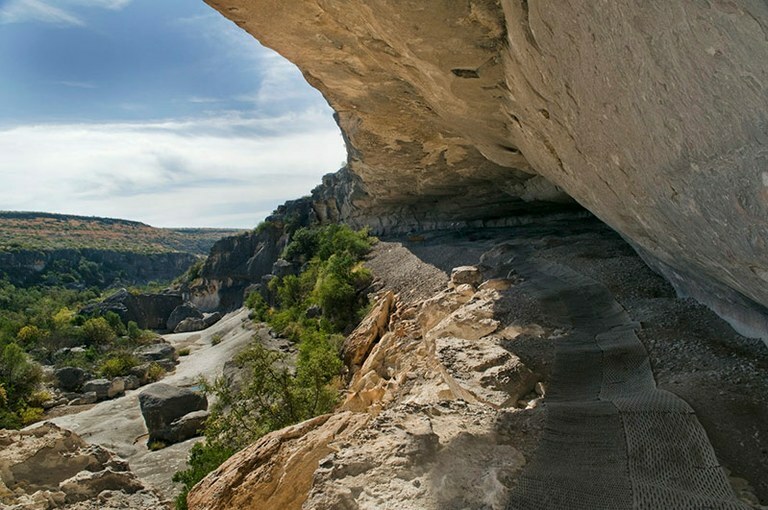 The Archaic people lived in the dry rock shelters that line the canyon walls. They subsisted on many of the same arid-adapted plants and small animal species that live in the park today.